You’ve hit the JACKPOT when it comes to premium Mitsubishi Triton Accessories! Are you looking to install a new canopy on your Mitsubishi Triton? Whether you are looking for security, extra storage space or a little bit of both, our canopies at PJ's 4x4 are varied and high quality to meet your needs. Currently, we stock a range of different types of Mitsubishi Triton Accessories at PJ's 4x4, including lids and proper canopy designs. All our designs are available in a variety of colours, which means you can find the right canopy whether your Triton is Silver, Grey or Red. Read on to learn a bit more about our Mitzy canopy models and the features and benefits of each. 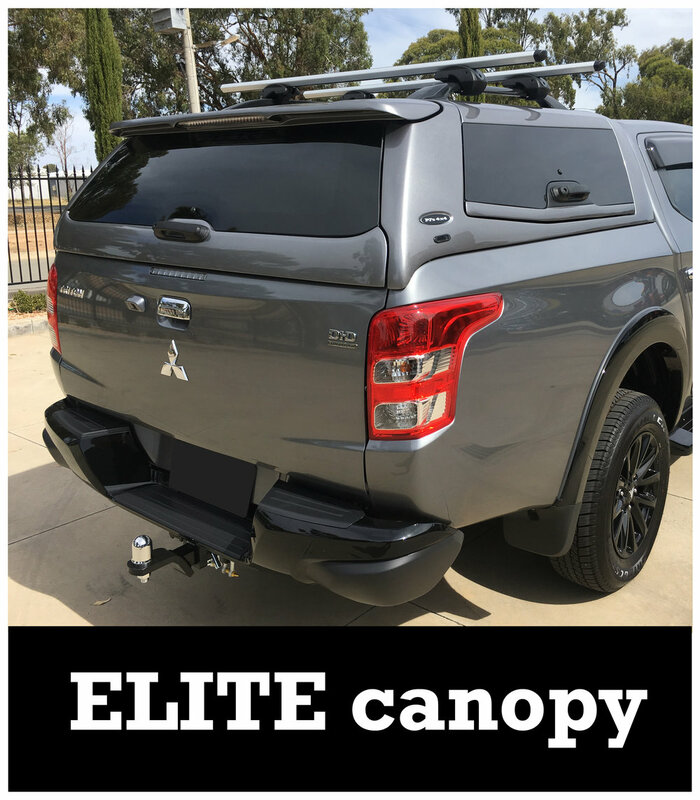 The Mitsubishi Triton Elite Canopy: If you want a canopy for your Triton that blends into the design of your car with seamless aesthetics and function, the ELITE canopy might just be the perfect choice for you. Our bespoke ELITE designs are crafted to match the lines, angles and colours for your vehicles so that they look factory-installed even though they weren’t. This MQ and MR canopy is also terrific for security, with tinted privacy glass and central locking, among other features. The Mitsubishi Triton Sports Lid: This hardtop ute lid balances security, space and luxury into one of the best Mitsubishi Triton sports lids available on the market—from any vendor. The underside of the lid is elevated slightly, to maximise space. The linkages, locking mechanisms and hinges are all durable, to provide a more secure and long-lasting design. And the fabric on the underside of the lid, paired with a 40-degree lid lift, provide convenience and elegance aplenty. The Mitsubishi Triton TopUp Lid: If you occasionally need the storage capacity of a full Triton canopy, but prefer the aesthetic profile of a sports lid, then this TopUp ute lid is the right choice for you. This lid can be closed and locked like a standard ute lid—though even then, it offers extra space. However, the most unique facet is that the TopUp lid can be locked into an upright, open-canopy position. It’s safe to drive with the TopUp lid in upright position—a fact that makes the lid as stylish as any sports lid but as versatile as any canopy. At PJ’s 4x4, we are happy to help you choose the right canopy for your Mitsubishi Triton. If you are interested in learning more about our canopies and lids, give us a call on 1800 008 458. We would be happy to chat with you about your hauling needs and point you towards the best MR Triton canopy for your purposes.